If you have a non-Chrome OS device, want to power two screens using the same Chrome OS device or want to use your Chrome OS device for more than Geckoboard, you should follow our general set-up instructions instead. 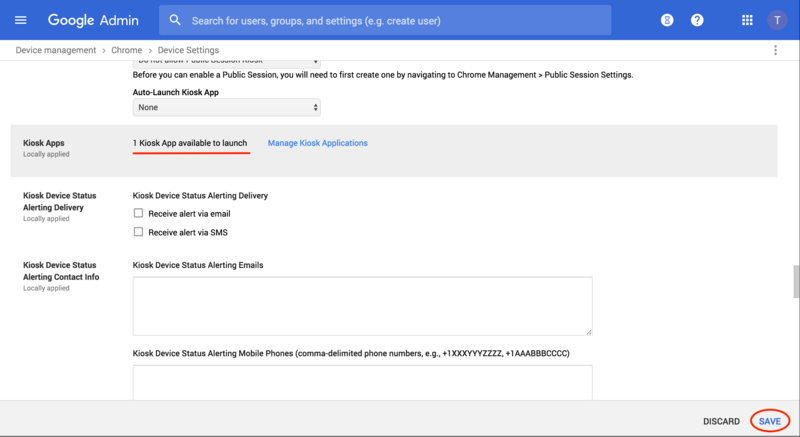 This article guides you through using our Send to TV feature to connect Chrome OS devices with Google Chrome Device Management (Kiosk mode). This includes our recommended device: the ASUS Chromebit. Kiosk mode allows you to run a single app on a Chrome device and lock it down so no one can interfere with it. Also, if there's a power failure or the app crashes for some reason, the device will auto launch the app again. This makes it ideal for displaying your dashboard on a wall-mounted TV. G Suite Super Admins on either Business or Enterprise editions can easily add Geckoboard as a Kiosk app. If you're a Super Admin or know who in your organization is, you can skip to Step 1. If you're unsure, check which edition you're using (you must be logged in first). 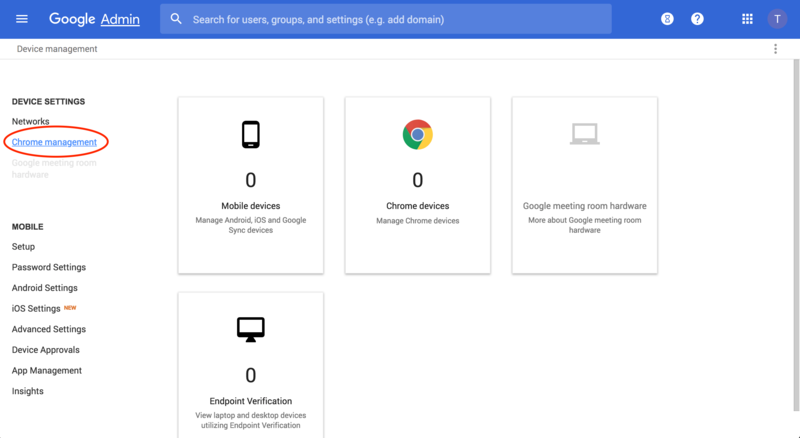 If you don't have access to an G Suite admin account, you'll need a Chrome Device Management License (CDM) to run Geckoboard in Kiosk mode. Without this, you will not see the option to use kiosk mode on your device. Do I need a Chrome Device Management License (CDM)? G Suite edition Are you are Super Admin? What are my options? You can use an authorized partner to purchase subscription licenses for Chrome Enterprise. To find one that suits your organization, go to Google's Partner Directory. We recommend purchasing through Promevo. Once you have access to Chrome Device Management console you can add Geckoboard as a Kiosk app for the upcoming enrolled devices. Log in to your Chrome Device Management console and click the Device management icon from the gallery. On the next page, click on Chrome management menu on the left. Scroll down and click on Device settings. 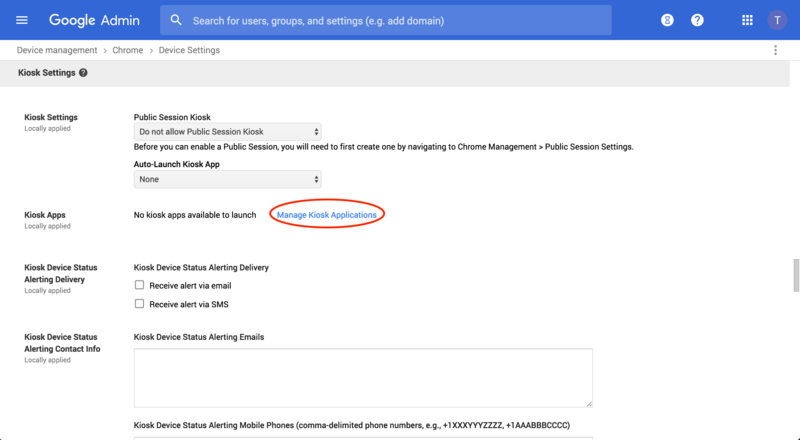 On the next page, scroll down to Kiosk Settings and click on Manage Kiosk Applications. Hit Enter. You'll see Geckoboard, click Add. Click Save. You will see that there is 1 Kiosk App on your account now. Under Kiosk Settings, click the drop-down menu under Auto-Launch Kiosk App. Select Geckoboard from the list. Now that Geckoboard has been added as the Kiosk app on your account, you can now start enrolling and setting up the Chrome device. Powerwash the device if it’s been used prior to this setup. This will erase all data and restart setup. After booting your device you'll see a welcome screen. Click the globe icon in the bottom left hand corner to set the language and keyboard, then click Let's go. Next you'll need to connect to your Wi-Fi network. Select your network, input its password, and click Continue. Read the Google OS terms before clicking Accept and continue. Don't sign in yet. Instead, press Ctrl + Alt + E to go to the Enterprise enrollment screen. Enter the email address and password from your Google admin welcome letter. You may be asked for a further code from Google Authenticator for 2 step verification. You may need the email address and password for an existing G Suite user on your account that has eligibility to enroll. After the process, your Chrome device may reboot and Geckoboard will start as a Kiosk app. 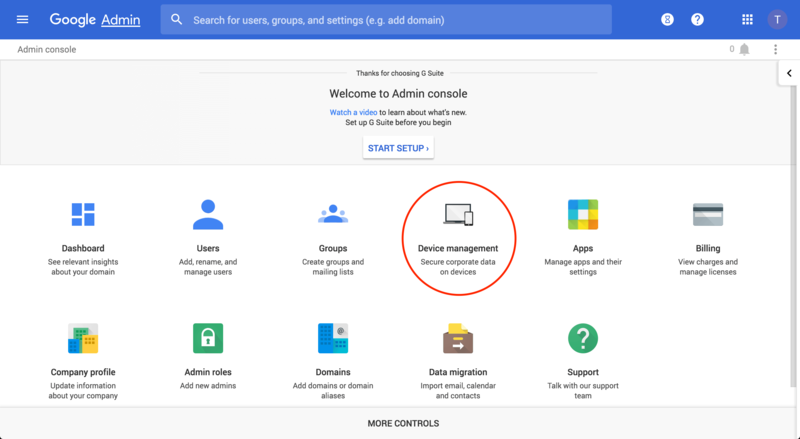 To connect your Chrome OS device, follow these steps. 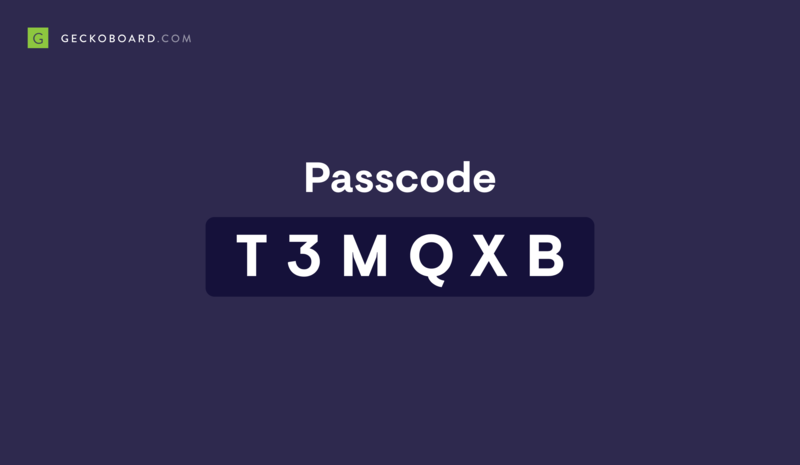 After setting up your device to boot with Geckoboard, you should see a passcode on your screen. 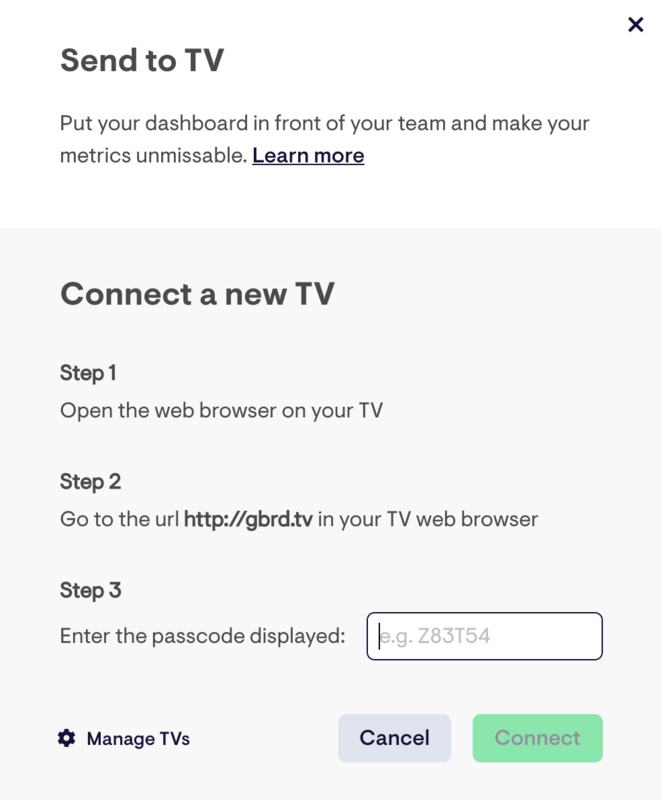 On your regular computer, log into Geckoboard and click Send to TV in the top right corner of your screen. Enter your passcode in the window that appears. The screen is now connected and should be displaying the dashboard you’re currently on. To change which dashboard or dashboard loop is displayed or to connect more devices, click Send to TV.